Use your monitor's optimal thanks to a sophisticated thin edge. Because the edge is so thin, the user is less distracted when he looks at the monitor and he can therefore concentrate better themselves. Thanks to the extra screen space also makes it easier to set up a workstation with two screens, so users can be more productive. But for those who are only looking for a clever screen this thin edge gives a sophisticated touch to any desk. Optimize your viewing experience with the superior AD-PLS technology (Plane to Line Switching) from Samsung. The SC650, both vertically and horizontally has a viewing angle of up to 178 degrees, provides a clear and detailed picture by maintaining true to life colors, even when viewing from an extreme angle. The result is always vivid and brilliant. Give your employees an optimal viewing experience in the office with the affordable Samsung Business Monitor. While conventional monitors have a viewing angle of 170 degrees horizontally, the Samsung monitor has an extra wide viewing angle of 178 degrees. Those eight additional degrees are especially useful when information displays on the screen at one or more colleagues, or when you present your ideas to customers. 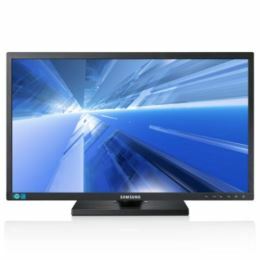 The Samsung Business Monitor has improved its vertical viewing angle 18 degrees, making this the perfect screen to give presentations to a large audience or when viewing other content, such as movies. Find the perfect ergonomics with standard adjustable in height from Samsung (Height Adjustable Stand (HAS)). With simple operation, the user can adjust the height and angle of his own eye level, which enhances productivity. So the user can always benefit from the best conditions. Mega Dynamic Contrast Ratio delivers an entirely new level of color and image quality with lifelike images. The breathtaking contrast ratio Mega Dynamic Contrast Ratio shows blacks at their absolute darkest and purest whites and other colors at their brightest. The crystal-clear picture quality is immediately apparent. With this explosion of colors like other screens seeming dull. Enjoy your multimedia content with the professionalism it deserves. Thanks to a built-in stereo speaker Samsung provides a duplex speaker for stereo sound with high quality and a richer multimedia experience. Enjoy movies and music as though you are in the theater or a concert hall, thanks to the excellent sound of Samsung. Enjoy total comfort and make the most of your home or office environment with cost-effective built-in speakers. Give your screen the best possible place with the VESA wall mounting. Which is easy to fix and install, convenient, secure, compatible, and the perfect partner for your monitor. You always have a perfect viewing angle and makes the most of your space thanks to its slim design.